I was at the launch of the Gala Premier of London The Summer Musical and indeed it’s a musical not to be missed as I’ve watched it the second time again too! A fun experience when you arrive to the surf beach entrance, a train or buggy car will bring you over to the Amphitheater in Sunway Lagoon as it’s a slight walking distance. Excited as we hop on the train. The entrance. It’s been awhile I have’t watch any musical. With lots of comments it will be good as the crew had performed before last year on a different musical and it had been a blast! The crowds and seatings in the Amphitheater. It’s slightly warm so you can keep your sweater at home and bring out the shorts! London The Summer Musical tells of the three bubbly and happy-go-lucky air stewardess on their 48 hours pitstop to London. What turns out from a sightseeing holiday after hours of flight, they met a couple of guys when a little of love and romance blossomed and reignited their love for singing, daning and performing on stage. Great combination of today hits to the 70s hits. From One Direction to Michael Buble and Geri Halliwell as well as James Bond themes, great combination with entertaining hits. You just won’t be able to keep your eyes away from the crew! They are amazing! A great family outing as the musical is suitable for all ages! I’m sure some of the songs may bring back memories from your parents, friends and well you too! Catch the musical before it ends on 8th July! The shows are available daily at 8pm except tuesday. 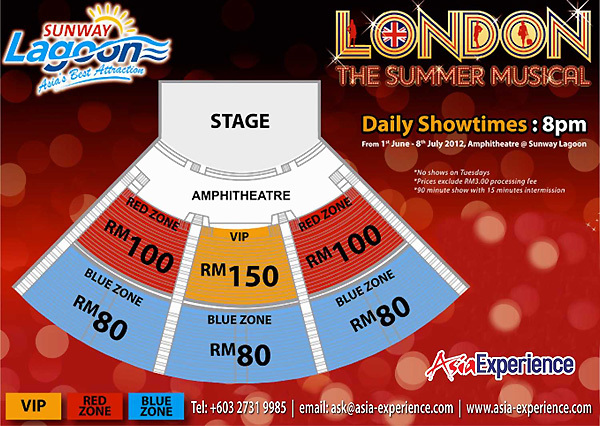 Get your tickets on redtix.airasia.com or from the Sunway Lagoon box office.